As much as the Apple AppStore still dominates on the gaming front, it's great to see that there are now PLENTY of great Android games to the point that I just don't think it matters, from a gaming perspective, which platform one gets. Edit: Burn the Rope is the second of a block of three puzzle games we are reviewing (the others being Nano Panda and Cut the Rope). 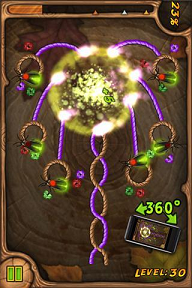 Burn the Rope features a series of puzzles in which your goal is to burn as much of the rope as possible. You are graded on the Qix (old arcade game) scale by completing a percentage of the rope and have to meet a minimum in order to pass on to the next level. For some reason the flame in this game only burns upwards although no explanation for this is provided. Because it only burns upwards you'll be twisting and turning your phone around in circles and it'll be very easy for your boss to tell that you're not working on a spreadsheet. However, all this twisting does make the game more interesting. I was able to quickly rotate my tablet back and forth to keep flames going in both directions, but that was a pain and really isn't the idea. The first puzzle features something that is kind of star shaped and you'll be spinning your phone around to consume all of the rope with ease. Subsequent puzzles require directional shifts and some planning in terms of where to start the flame. Shortly thereafter, little colored ants crawl around the rope and buring them is worth bonus points and also changes the color of the flame. See where that's going? Yes, next you've got different colored ropes that can only be consumed by a flame of the same color. And, of course, more stuff is added as the game progresses such as a light's out mode in which the screen goes dark and you have to remember where your spark needs to travel in order to burn the rope. Burn the Rope's graphics are, once again, good enough for a puzzler. It's got a nice sizzlin' sound for the rope burning and plays smoothly. I didn't have any issues with starting my flame via touching a part of the rope and the rotation of my device gave me a different puzzle experience than I've had with other puzzle games. And as for the puzzles, I have found them to be of reasonable complexity with a good, smooth increase in difficulty as I continue to play. My initial feeling was that there wasn't much here, but as the game progressed I realized that there is far more to it than meets the eye including a heavy timing element in later levels. However, with all of the flipping my phone around, I'd have to rate this as more of a combination puzzler and dexterity game than just a puzzler. Burn the Rope is available as ad supported direct from the Android Market and can be upgraded to remove the ads (I think that's what the upgrade does??) via an in app purchase. I'd have to say that Burn the Rope isn't quite as puzzling as Nano Pandas as I was never really stumped on any of the puzzles that I've tried for longer than about 5 seconds (and I've gotten pretty deep into the game). It does add the dexterity element, though, which makes for an interesting experience that only time will tell if it's pure novelty. It also adds a Puzzle of the Day feature which is interesting in addition to the basic 'campaign' and a 'coming soon' campaign. Do I like it? Yes. It's very good for now, but I suspect that will drop to a good as the dexterity element becomes old hat. 4/5 stars. Edit: The next three reviews will cover Nano Panda, Burn the Rope, and Cut the Rope (all recently release puzzle games that hit the same part of the brain). The first two are currently available in the Android Market and Cut the Rope is set for imminent release on the Android Market and can be obtained from getjar.com until then. 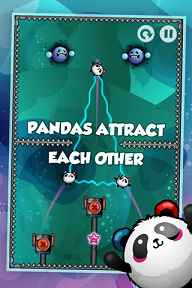 Nano Panda is another entry into the crowded genre of cute puzzle games. The premise is simple... you launch the tiny nano pandas and try to get them to touch (and destroy) the angry faces (aka evil atoms). The game tries to cash in on the cute puzzler genre with cute little pandas being tossed about instead of red dots, but it really doesn't hit the same level of cuteness as Angry Birds (I'm convinced cuteness is at least 50% of the reason that title is so successful) or Cut the Rope (he looks so sad when he doesn't get his candy!). Now if all you had to do was launch pandas then that wouldn't be too interesting so let's add that when multiple pandas are in play they attract one another. It's easier to understand when you see it, but the attraction is basically like gravity. If the pandas are close they attract and swing around in a small ball, but if they were far away they zip towards and right by one another covering a much larger area. It's this swinging and chaining of panda that allows you to get them to knock off all of the bad guys. Add that the screen also contains spiked areas that kill off your pandas upon contact and you've got yourself a game. The graphics of Nano Panda are fine for a puzzle game as is the sound. No glaring deficiencies and nothing earth shattering either. The controls are simple... touch a launcher to release a panda. The key to the game is figuring out the order and timing in which to release them. As you would expect, the game comes with several confidence builder puzzles to show how to launch and then how the pandas attract one another, but soon you'll get to stages that are quite difficult. Do I like this game? Yes and no. Yes, because it is pretty well executed... works on my phone AND tablet just fine... is pretty simple to play... and was just a dollar (I bought it the day before it was Amazon's free app of the day... aargh). No, because I find myself all too often resorting to trial and error versus thinking to solve the puzzles. This isn't necessarily the game's fault, but rather more a factor of the game's complexity and figuring out the results of the gravitational pull of two of more celestial bodies of equal mass is perhaps a bit too much for me when I'm sitting down for some entertainment. In a nutshell, it's faster for me to do trial and error rather than plotting things out and I suspect most will share that sentiment. I'm sure some are more inclined to processing this kind of puzzle and perhaps want a real challenge... if so then this is for you, but you'll have to resist that trial and error temptation. The bottom line is that I suspect this kind of puzzler will have a more limited appeal than a game like Cut the Rope and it really hasn't been able to hook me. 3.5/5 stars. There are both a full paid version and a free version in the Android Market should you wish to try this game. Just a quick post that I'm still alive. The good news is that I've had time to play lots of new Android games. The bad news... I still have to find the time to write them up. I've actually been at the Origins 2011 Game Fair from Wed-Sun of this past week and while that has little to do with Android gaming it left me with time to do half the work on several upcoming reviews. In the board game community one of the game classifications is "dexterity game". Jenga clearly falls under this class of game. And recently Jenga earned a special place in my heart when it became the first game that requires some thought that I could actually play an intelligent and competitive game of against my 4 year old. So how do we translate a game that requires the infinite precision of touch that our hands and fingers grant us to a digital touch screen device? Well, my first answer is "we don't", but apparently someone felt different about such a response. My second answer is "we shouldn't". First, whenever I run Jenga I actually have to run it twice. The first time I see a logo from Natural Motion along with some music. I then have to exit back to home screen and run it again and then it somehow works and I make it to the title screen. This behavior has been consistent (on my Eee Transformer tablet). I'm going to guess that it works on some devices just fine and doesn't on others with behavior like that. Unfortunately, I didn't enjoy the game enough to try it on my Android phone. However, given the touch screen interface that the game employs I just don't see how my phone's screen would be big enough to derive enjoyment out of this title, but I am getting ahead of myself. 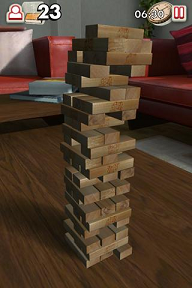 The game features a couple of play modes... traditional Jenga in a solo mode, an arcade (time based) mode, and pass and play. When playing you can do one of two things: 1) tap a block to see if it's loose or 2) hold and drag a block to remove it. Now, my harshness of a review against this title is primarily because IT'S NOTHING LIKE REAL JENGA! It shouldn't be called Jenga. How this is racking up an average 4 star review in the market place is either beyond me or it's because people that have never played real Jenga love it (for whatever the reason). In real Jenga a good part of the thrill is in taking advantage of physical differences of the blocks that create imbalances where there's no pressure on some blocks aloiwing them to be easily slid out. In the computer adaptation such blocks are few and far between and it seems that almost every block has at least a small effect on the tower. Perhaps the game's physics is too perfect? In real Jenga after enough blocks have been removed the tower will lean ever so slightly. I never experienced that with the digital version. In other words, trying to digitize an experience that relies on imperfections of the blocks along with my incredibly sensitive hands and then taking that and converting it to two actions is missing something and perhaps everything. Ok, enough about this not being Jenga... let's pretend they didn't call it Jenga and instead called it j3n64 (I didn't make that up... they did) to continue the review. The graphics are good enough and accomplish what they are supposed to. You can easily navigate up and down the tower as well as flip it around to gain access to both sides of each block. The touch interface basically works although I did have minor inaccuracies when I would touch and the game would disagree with me as to which block I had selected, but the game highlights the selected block to ensure that I don't actually proceed with a mistake. Given how the instructions say the touch interface is supposed to work it is spot on and works pretty well. Dexterity games are tough to pull off on a digital platform. For what it's worth I find the various attempts at Skee Ball clones to be dull (although my four year old seems to enjoy them). That said, Jenga for me is a big miss. If I had to rate it for being Jenga like then it would be a 1 star game, but I'll try and normalize it and give it 2.5 stars. I just think there are far better games to play such as some of the block balancing games that are in a similar genre and X Construction (another physics building game) also comes to mind. And I'm a bit stunned to make the connection that this is from the same company that did the excellent Backbreaker Football. All I can say is buy that instead. 2.5 stars. Noemar Games Studio, an upcoming amateur game development team based in Spain, is glad to present their 1st game released for the Android platform called CrossMaster. CrossMaster is a puzzle game with a simple concept. 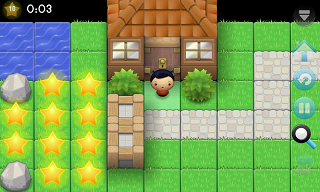 Challenges are composed by a grid of blocks, which player have to clean up by crossing them. What looks a simple task, become more complicated as only some certain number of blocks can be crossed each move and only in a row and column. If player run out of moves, he will have to reset the challenge and start again. What to cross should be considered very carefully! As player progress, challenges increase on difficulty both in number of blocks and blocks to cross. After some easily solved levels to show the game rules, game could become quite challenge and addictive. take care! Game is presented in 2 versions, a free ad-supported version including 30 levels of increasing difficulty and a full version including 150 levels and 2 game modes for €0.99. Renier Knizia is a prolific game designer. He designed what I currently consider to be my favorite game of all time. He's also a big time egomaniac as demonstrated by his insistence on renaming all of his works from "Game X" to "Reiner Knizia's Game X". His earlier games showed off Knizia's brilliance, but his latest games are often rehashes of shoebox formulas in game design so I'm always trepidacious whenever I come across a new Knizia game nowadays. Basically it means "do not buy until you've played it several times and are sure you like it" which hasn't happened in a long time, but Labyrinth... err Reiner Knizia's Labyrinth is an Android Market freebie. What is Labyrinth all about? No, it's not a tilt puzzle in which you have to get the metal ball in the hole. It's a tile based board game. You are a brave hero venturing into the depths of the labyrinth in order to uncover great treasures, defeat fearsome monsters, and escape with your life. You will draw tiles from a deck of cards and will place them on the board. Your primary goal is to create a path from start to end given the walls on the tiles, but you also want to ensure that treasures and gems are also on the beaten path. In addition to that is the idea of combat. 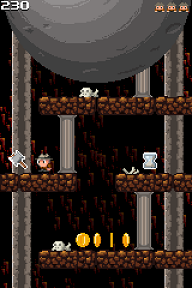 The maze also contains monsters and swords. Once a monster is on your path it will cost you swords to defeat it. If you have enough swords then you win (and both monster and sword disappear), and I don't have to tell you what happens if you don't have enough swords. Ultimately Labyrinth is a game in which you play against a deck of cards. Mr. Knizia has a game called Robot Master on the iPhone that is pretty much the same game but with a different dress on. Make the best of it with the tiles you get in the order in which you get them. But I'm a fantasy nut so the fantasy version (aka this one) appeals to me more. This game does offer additional elements in later scenarios, but it all comes down to that balance of intelligent placement of the tiles (the strategy) and some good old fashioned luck of the draw. Graphically the game is good for a board game, and the audio accompaniment is nice. Tribeflame did a nice job with the development of the game (they also did Through the Desert). However, at just under 50 meg this seems to be pretty huge for a game of this simplicity. Controls rely solely on the touch screen and the dragging of the tiles or tapping them for rotation. All in all this is a nice, little tile game that passes the time. Don't get too caught up in the strategy as the best laid plans can be quickly demolished by a bad draw and achieving high scores is often a matter of risk plus luck. For some casual fun, however, look no further and with a pricetag of free it's hard to go wrong. 4/5 stars. “Tiny Bee” now available on Android Marketplace and AndroidPit for Android phones! This afternoon, just in time for the weekend, the full version of “Tiny Bee” will be available on the Android Marketplace. After putting up with great reviews and comments on the demo, the much anticipated full version will be ready for download! Cologne – May 24th, 2011 - The Tiny Bee has to cross the mountains ahead of her. Unfortunately she isn’t a supreme master in flapping her wings and so the mountains ahead seem to be a big problem. Thank god the world is full of hills which force the pace. The player has to build up speed to slide along the hills and let the tiny bee soar. Make sure to have a soft landing and collect as much honey or pollen as possible. Attention, beware of the Storm! Rain is the worst thing for bees. There are several achievements to earn and tasks to achieve. Share scores via OpenFeint and climb your way up to the top of the leader boards. “Tiny Bee” provides outstanding entertainment and brings the sweet yellow striped friend right on the Android phone. Great graphics and a simple touch control generate a realistic and entertaining action game for HTC Desire, HTC Wildfire, Motorola Milestone and Samsung Galaxy S devices. If you had only one word in which to interest me in a game, the word to choose is "roguelike". I have logged an astounding quantity of time playing roguelike games, including ascending every character class in Nethack, winning Angband with a half-dozen character or so and just basically playing these types of games as much as I can. 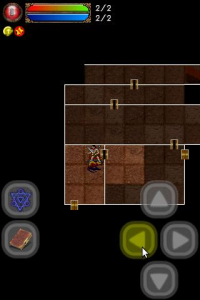 Nethack, in fact, was the first thing I downloaded on my Droid after getting it. So, all I needed to see for Sigmore Mines 2 is that it's a roguelike, and I was off and running. A roguelike game, for those who haven't encountered the term, is a game that is like the original Rogue, one of the very first graphical adventure games around. What distinguishes roguelike games is that the levels and environments are programmatically generated instead of being statically created by the level designers. That means that these games present fresh challenges every time they're played, giving a wide variety of game experiences. Probably the game that most folks are most familiar with that takes the basic idea behind roguelike games (and runs far with it) is Diablo, which resembles a roguelike in many ways (although roguelikes are usually turn based). The more advanced roguelikes present a huge variety of monsters, treasures, equipment and environments and can sometimes be bewildering in the variety they provide. Sigmore Mines 2 (SM2 for the rest of this review) is designed for small screens, and in fact is available on J2ME as well as Android. Being designed for such a constrained environment as J2ME means that a lot of the variety of a later roguelike is missing from SM2. There's really only one kind of environment, about a half-dozen basic types of monsters and one character class. The town consists of just three people, and the levels are not particularly large. 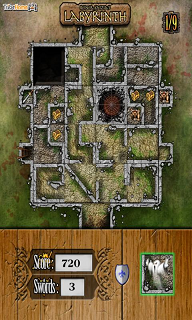 Perhaps more damaging is that there aren't very many features that crop up in the dungeon, with only a couple of things you might encounter beyond just hostile critters. There are also only a few actions your character can take, with the on-screen controls being limited to walking in the four basic directions, a spell book button and a quick button that can be bound to a particular spell. The only remaining commands are accessed off of the menu, and mostly you'll just be looking at your character or inventory from there. The game is pretty rough right from the beginning. You get a single point to distribute to one of your six stats (later levels give you 7 points) and then off to the dungeon. You have to kill five rats to gain your first level, and be prepared to die often before getting there. Your hit rate with your melee weapon is very poor, and it only takes a couple hits to bring you down. The good news is that you can head back to town and save any time you want, which you'll need to do frequently. One thing that makes the game more difficult is that the stats aren't really explained to you, and I at least allocated some points in a way that I wouldn't have chosen after I learned more about the game. You also start with 20 gold, which you'll want to spend wisely for your first set of equipment, as your equipment makes a big difference. Later, as the game moves on, it remains pretty rough for a while. Eventually, I was able to get to the point that I could handle everything in the dungeon with ease, with the exception that occasionally I would be fatally lit on fire (if I didn't have any extinguish fire potions on me). I was able to increase my frozenball spell high enough that I could kill most things in one shot, occasionally two, and even if they didn't die from the first blast they would often be stunned for double-digit turns. I did eventually play all the way through the game and defeat the final boss, which was satisfying although the winning message was a bit anti-climactic. There were some things I liked about the game - the size of the game was manageable on my phone, and it was pretty easy to play in small bites. There were some technical issues with the game, including the fact that the game doesn't save its state when put into the background, so if I did too much before switching back to it, I would have to resume from my last save game. That meant that I had to try and make it back to town in order to save progress which hampered the quick-slice approach to playing the game. There were also a few smaller technical issues here and there, but nothing huge. Another issue is that every step would sometimes wait for a bit before I could take another step, friction that slowed down the game. There also was no run function (which most roguelikes have) and no way to rest for multiple turns, which meant that when I needed to recover mana (in order to heal myself or get ready for more frozenball spells), I spent a long time running around in circles. There were also a few too many menus in places. It all added up to an interface that felt slower than it should have. Roguelikes should be pretty rapid-fire, and this just felt slow too much of the time. Add in the lack of variety in the game and the relatively high price, and I can't really recommend the game. There are other options for roguelikes on Android, and although I did play to the end and had some fun, only roguelike addicts should be having a look. There is a free version to try out first, which I recommend anyone try out first. I'm going to give Sigmore Mines 2 stars. With some interface improvements to make the game much faster flowing and state saving when put into the background, that could climb, though. I've enjoyed the idea of sniping in games ever since Unreal Tournament introduced the concept (and I don't know that it was first). Finding a good hiding place and then waiting for that surprise kill only to repeat the process (as nobody ever knew what hit them) was quite a rush. Next came arcade games like Virtua Cop and Silent Scope which turned sniping into an arcade experience. Army Sniper is another sniping arcade game. The game follows a storyline where you are hunting down a criminal and then features scene after scene in which you have to eliminate all of the enemy's bodyguards. Army Sniper's graphics are pretty good as are the audio effects. Controls rely on the touch screen coupled with the accelerometer. Point to an area on screen to zoom in with your sniper rifle and then twist to line up that perfect shot. Once you're done aiming then touch the first button and 'bang'. Tap again to zoom back out and find another target. Each scene is timed and requires you to nail many enemies... enemies that appear our of nowhere. There might be a couple on screen at once... kill them all and others apparently time warp in. Army Sniper is actually pretty well done. It plays smooth, but I really didn't find much challenge in the levels and they were all repetive with the only difference being the background painting. Kill a bunch of people... read a story (often consisting of broken english)... repeat. After playing through four frames I had had more than enough and was left with little desire to keep playing. I'm left feeling like there's a pretty good game engine here that just doesn't execute well. Why? 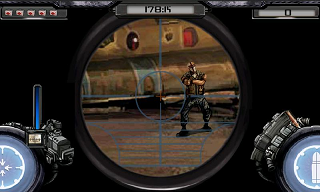 First, other games like Virtual Cop added a better pressure element giving you a countdown before you would be shot. Here, you just use the flashes of light from those shots to zone in on often small targets. And, of course, the scenarios aren't different at all. I remember having to shoot the criminal running across the football field with a hostage in Silent Scope which really increased the excitement in that game's story. No such luck here. I'll also add the Army Sniper would not play on my tablet. It's interpretation of the tablet's accelerometer wasn't correct (I've seen that in other games), but it worked fine on my Galaxy S phone. All in all I'm just left with a game that feels well done from the start, but doesn't have enough oomph in it for me to want to play for long. 3/5 stars. Super Drill Panic advertises itself as being part of the "dropping ball" genre. I had not heard this catch phrase before so I figured I had to try it so that I could also be one of the "cool kids". After playing it I'd say it felt more like a reverse Doodle Jump so I then checked out some other "dropping ball" games. Super Drill Panic was far better than they were so here's the review. In Super Drill Panic you play the role of Indiana Jones (not really as that would be a trademark violation) just as he uncovers the rare artifact from the temple. But, as my 2 year old would say, "Oh No!"... a giant boulder trap has been unleashed. Valueing your life you decide to get a move on it, but can you resist the many temptations of gold on your way out. Perhaps you have just enough time to scoop some up a take it with you? Super Drill Panic sports simple retro graphics in Orange Pixel style along with on cue sound effects and an array of one liners to bring you back to a simpler time in gaming history. The controls are easy and the game requires just one hand to play... tilt left and right to move. As you tilt back and forth jumping down the screen from platform to platform you'll have the opportunity to pick up additional treasures for more points. And eventually you'll find the exit... if you don't get crushed first. The simple controls make this a great mobile phone game and the extras, such as spiders dropping down from above, make this a game worth playing on through. This game also supports Open Feint which also lead to it not working on my phone properly until the most recent update. Bad that for six weeks I couldn't play a game I paid for (it crashes after a few stages). Good that Orange Pixels continues to release updates and improve their products. Super Drill Panic is all about pressure and figuring out just how much you can grab while still getting out alive. And it's a great mobile game that can be played quickly with just one hand. Just think, if you have two Android devices (and two hands) you can play two games of it at the same time! How many other games can boast like that? 4/5 stars. When my Android tablet arrived two weeks ago I immediately started installing apps. After that was done I then started testing apps and it's stunning how many games have problems on these new tablets whether it be not taking advantage of the big screen or the accelerometer not being interpreted correctly or what not. I'm not blaming anyone as progress has its sacrifices, but naturally it would be nice to see everything updated... and updated now! Next, I started looking for games that were written for tablets and/or took advantage of the Tegra chipset in my new tablet. Walkabout was one such game that worked on both my phone and played just fine on my tablet. So what is Walkabout about? It is a puzzle game in the same vein as InfeCCt (which is a game I really like). In a nutshell, you have to get from the start to the exit while collecting all of the stars by walking one space at a time such that you do not backtrack (i.e. repeat any spaces). Walkabout actually ups this formula a bit by adding levels so that you can walk on the same spot twice (effectively adding a third dimension to a 2D puzzle). Walkabout's graphics are decent with what I'd refer to as blue sky/green grass type scenery and sound is on par with what you might expect from a puzzle game. Controls are entirely touch based and you move left/right/up/down via swipes. I have to admit I prefer InfeCCT when it comes to controls as it lets you draw your path versus having to swipe, swipe, and swipe again to get around. I also think InfeCCT has far better music that put me more in a zen type mood to play this kind of game. However, Walkabout's 3D nature adds an interesting elements to some of its puzzles not to mention additional elements that are added in later levels. Walkabout also uses a time based scoring system which just seems silly for this kind of game. Of course, the first time through (when actually solving the puzzle) is going to be slow going versus once I have figured out the answer. Walkabout is a solid puzzle game and it is a solid choice when compared to its competition. It probably offers a bit more puzzle than a game like InfeCCt whereas InfeCCt creates a better play mood and makes the game feel more like time at a spa. I like them both and give Walkabout 4/5 stars.